Place chicken breasts flat on cutting surface. With knife parallel to cutting surface, cut a lengthwise slit in each chicken breast, forming a pocket, keeping other 3 sides intact. 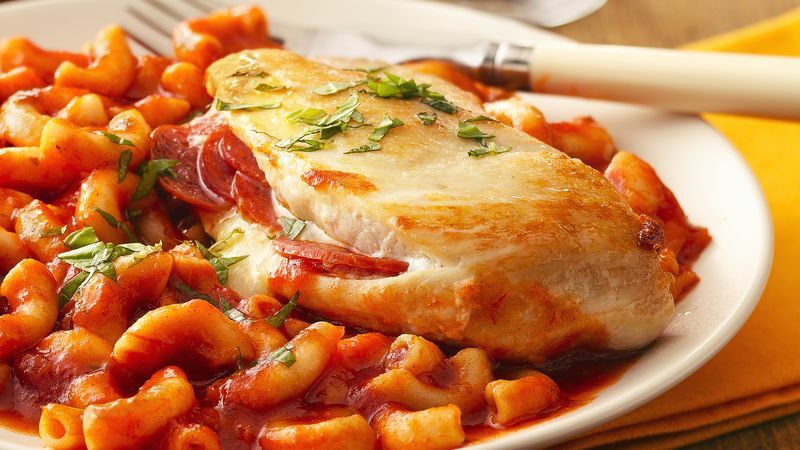 Stuff each chicken breast with pepperoni and mozzarella cheese, pressing the edges of each chicken breast to seal. In 12-inch nonstick skillet, heat oil over medium-high heat. Cook chicken in oil about 9 minutes, turning occasionally, until well browned on both sides. (Chicken pockets will open slightly during cooking.) Remove from skillet and set aside. In same skillet, slowly add water so as not to splatter. Increase heat setting to high. Heat water to boiling. Add macaroni; cook about 3 minutes or until almost tender. Do not drain. Stir in pasta sauce. Heat to boiling. Return chicken to skillet. Reduce heat to medium . Cover and simmer 8 to 10 minutes or until juice of chicken is clear when center of thickest part is cut (170°F). Garnish with basil. For an extra-cheesy dinner, sprinkle finished dish with additional shredded mozzarella cheese. It will melt on its own as it stands. To save time, stuff the chicken breasts ahead of time and keep refrigerated until ready to brown.